Xiaomi has surprisingly announced a new 4K MIJIA laser projector. The device can create up to a 150-inch display and will last for over 25,000 hours. The projector will cost 14,999 Yuan, but Xiaomi is currently running a 5,000 Yuan introductory discount. 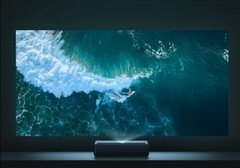 Xiaomi has already released a range of projectors and TVs, with the company recently announcing a crowdfunding campaign for its MIJIA projector (Youth Edition). The small 2,199 Yuan (~ US$310) LED projector supports HDR10 and can display in up to 1080p at 500 ANSI lumens. The Chinese manufacturer has followed this up with a 4K version of its MIJIA laser projector that the company first announced in 2017. The 4K MIJIA can create between 80 and 150-inch screens and utilises HDR10 technology like its cheaper sibling, but only needs to be placed 49 cm from a wall to create a huge 150-inch projection. Moreover, you can place the projector just 14 cm away from a wall if you want an 80-inch screen. Xiaomi claims that the 4K MIJIA has a 3,000:1 contrast ratio and can reach up to 1,500 ANSI lumens. Additionally, the laser is rated for up to 25,000 hours, which equates to over 17 years usage if used for 4 hours per day. The projector also has stereo speakers that provide Dolby Virtual Surround Sound. The device comes with a remote and is equipped with 3 HDMI ports, a USB 3.0 port and an RJ45 Ethernet port among others. The 4K MIJIA officially goes on sale for 14,999 Yuan (~ US$2,200) on January 18, but the company has started running an introductory pre-sale today and is offering a 5,000 Yuan (~ US$738) discount.